Examines the world Bank a powerful entity that is responsible for building and breaking entire nations. To any people, the term ethical economics may seem like a bit of an oxymoron, because most fortunes are built on scrupulous practices. The World Bank epitomizes these scrupulous practices by permitting certain individuals to monopolize the world's resources. There are more than enough resources to care for the more than 7 billion people residing on the planet, but the way they're divided means some people have to starve. 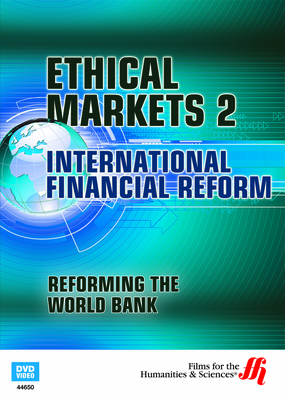 This enhanced DVD is one of nine that examines ways to more ethically handle the world's economy so children in third world countries don't die of starvation and preventable diseases. The world bank was founded in 1944 under the guise that it would help Europe reconstruct after WWII. However, it has only helped to serve the agendas of the wealthy and Hazel Henderson examines what's being done to correct this issue.